Journey's Edge Digital Desktop Weather Station Only $14.99! Ships FREE! You are here: Home / Great Deals / Journey’s Edge Digital Desktop Weather Station Only $14.99! Ships FREE! Journey’s Edge Digital Desktop Weather Station Only $14.99! Ships FREE! Check the temp in your office, easily access the date or check the time. Order one of the Journey’s Edge Digital Desktop Weather Station for Only $14.99! Ships FREE! 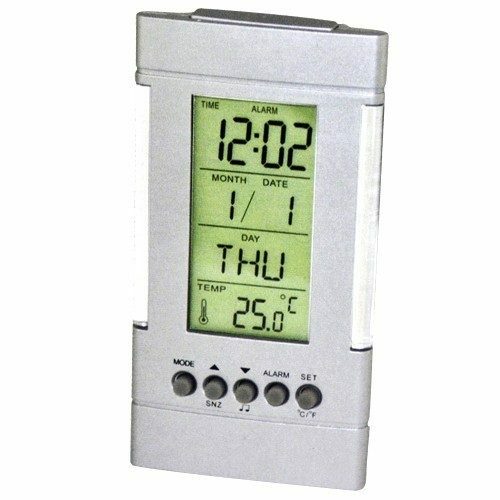 This unit stands up on a desk or table to display the current temperature of wherever you decided to place this sleek little unit. Also can inform you of humidity and moon phase. The Journey’s Edge Digital Desktop Weather Station also includes a built-in calendar that displays time, date, week, year and 12/24 hour time format and has a built-in alarm clock. Temperature settings displayed in Fahrenheit and Centigrade!